It's pretty moderate stuff today as we await Royal Ascot next week, but we'll have a crack at the big fields up at Hamilton Park, just for some sport! 6.20 - Leg 1: We kick off with a big field amateur riders' sprint handicap, and it might be a good placepot race if we can get the fancied horses unplaced. Two Turtle Doves is not ideally drawn but looks the most solid of the top of the market, with a consistent form string including in a fast ground six furlong sprint for today's jockey. He's an A banker. 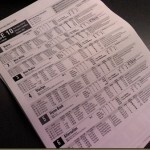 Obviously, in such a race, I won't be leaving it at that, and I'm taking a few on B, most of them at prices. Ivestar won this in 2010; Alpha Tauri is well boxed and has the best jockey (but does have a 0 from 19 turf record to overcome); Hab Reeh hails from the hot barn of Ruth Carr; and Foreign Rhythm, You'relikemefrank, and Script all have some sort of chance too. Mob handed on B. 6.50 - Leg 2: Well, it will be tough to get a draw if we don't cop for some sort of result in leg one, and it's not easy thereafter either! Little Eli has been running well, including when a neck victor last time over today's trip of five furlongs. That was a maiden, but he'd previously run well in a handicap as well and is in grand form. Cracking Choice is hard to win with, but he's got a lot of placed form in this type of company and, in the last year, has raced against and beaten rivals from this race six times. None have beaten him. Sugar Blaze is getting the hang of it now, and he might improve again after just four starts to date. 7.20 - Leg 3: Red Tyke is the most reliable here, if not the most capable. Ebony Express showed more for the step up in trip, and this extra furlong again might see him winning. And assuming Comical needed the run last time, then the money for him - allied to his plummeting rating - give him a squeak too. 7.50 - Leg 4: I'm against the very well backed Roker Park here. He had everything in his favour last time (great draw, strong stable form, going, class) and still only managed fifth, and I think his chance is over-rated. Rather, I prefer Hopes N Dreams, and Barkston Ash, both of which have plenty of track form and are in the right grade today. Jeannie Galloway has dropped a long way in the handicap and, if needing that first seasonal run last time (she has done in the past), she might hit the board. 8.20 - Leg 5: A Star In My Eye looks by far the most obvious here, and he's an A banker in a race which looks to lack depth. 8.50 - Leg 6: This may not be as straightforward as 6/4 the favourite, Oilinda, suggests. Argaki and Lady Artiste are both credible alternatives, and are added on B. That makes it quite a big perm, and eleven tickets for ticket builder players. Hopefully the dividend will justify the coverage! Ticket builder optimized perm - see below. 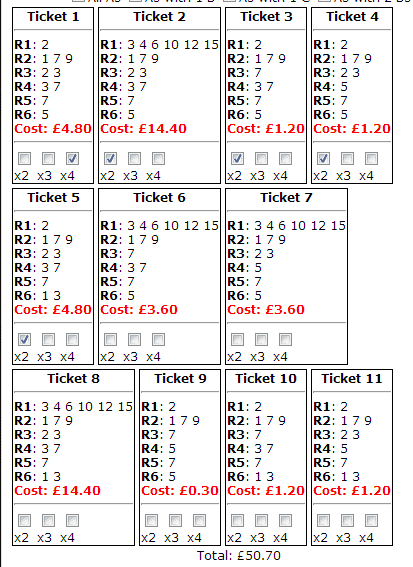 Readers can use the ticket builder at www.geegeez.co.uk/ppot/ to create their own part perms.